John and Laurie Raymaakers had a decision to make after the early-’90s recession torpedoed their property-management business — try to rebuild that enterprise, or go in a different direction. They chose, of all things, asphalt seal-coating, but that was only the beginning. Over the years, their company grew, added equipment and services, and is now a heavy civil-engineering firm and general contractor boasting 26 employees, with an intriguing side business in materials recycling — a true, under-the-radar success story in the local construction world. 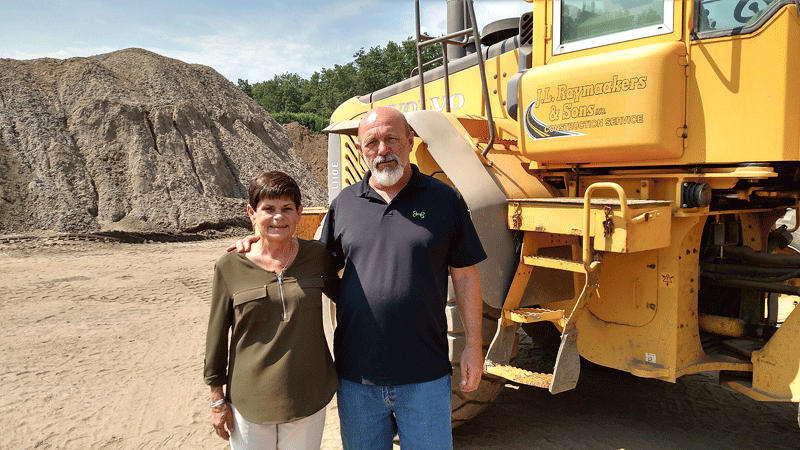 John and Laurie Raymaakers knew when to shift gears, even if they didn’t always know how. As the 1990s dawned, the couple ran a successful property-management operation, with 14 employees and some 900 units in seven apartment complexes. But, due to the recession that struck the nation’s economy at the turn of the decade, the owners the couple worked for started bleeding properties at a startling rate. 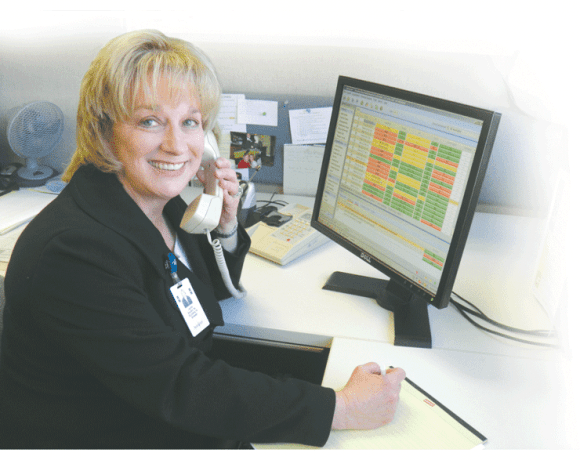 “We lost 73% of our business within six months,” Laurie told BusinessWest. With prospects bleak — Laurie went to work at a local police department and a Boys & Girls Club to help make ends meet — the pair looked for another opportunity to strike out on their own, and they found one in seal-coating asphalt driveways and parking lots. Today, however, ‘this business’ has moved far away from its roots fixing driveway cracks. J.L. Raymaakers & Sons — the couple’s two boys, John Jr. and Joshua, grew up to become partners in the company — is a general contractor and heavy civil-engineering firm employing 26 people and maintaining a fleet of 17 trucks. The progression between the two points is a lesson in identifying opportunities and working hard to grab them, with the goal of growing a modest, Westfield-based family business into a multi-faceted operation. Exhibit A is the seal-coating idea itself, one John came up with while researching what types of businesses he might be suited for, and which of those weren’t suffering from an overcrowded market. 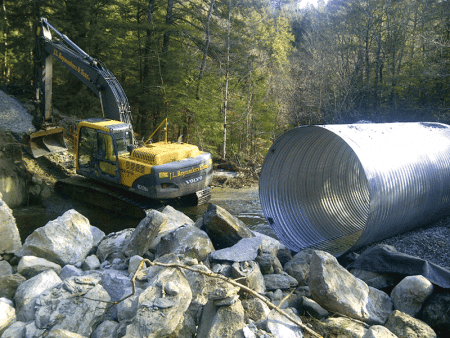 This culvert installation in Blandford is an example of J.L. Raymaakers & Sons’ civil-engineering work. For instance, some parking lots couldn’t be seal-coated until a broken catch basin was fixed. So they learned how to fix catch basins, which became a lucrative part of the business. Then they added small excavating projects to their roster. From a couple of employees and one dumptruck, J.L. Raymaakers & Sons expanded further, getting into some pipe work, which led to the company’s most significant niche to date, heavy civil engineering. “We’ve always been a general contractor, even from the property-management days, when we’d do carpentry and electrical,” John said, but the firm would, indeed, find its most profitable growth from the ground — or beneath it, actually — up. Today, John told BusinessWest, the firm regularly takes on $2 million to $3 million jobs, with work ranging from storm-basin cleaning and repair to storm-drain installation and repair; from water and sewer-line installation to concrete work and retaining walls — a step up, certainly, from seal-coating driveways. Recently, these jobs include a pump station handling sewage for three Southwick schools, a fuel-containment center at Bradley International Airport that involved moving million-gallon tanks, a new water-distribution line for the Thorndike section of Palmer, and, on the general-contracting side, a new security building at Savage Arms, a company for which Raymaakers has completed several projects. That’s being accomplished partly through a recent foray into a steel-building division that promises to keep crews busy in the colder months, when civil-engineering projects tend to shut down. In many instances, Raymaakers is working at the subcontracting level, with an eye on positioning itself as the lead contractor — controlling projects and hiring subcontractors — on an increasing number of jobs. That said, the flow of work on the civil-engineering side is strong, even though the firm is typically competing with 15 others to, say, install a water line. Still, the company has hired at a consistent pace over the years, and expansion has taken several shapes recently, from new equipment purchases to the hiring of a second project manager. Meanwhile, John Jr., whose main role is project manager and estimator, and Joshua, a site supervisor, are slowly transitioning into greater leadership roles with the intention of someday running the company on their own. General-contracting work, like this warehouse, helps the firm stay diverse and busy throughout the year. But the family didn’t stop there. Through their civil engineering and construction work, J.L. Raymaakers & Sons digs up a lot of dirt. So instead of piling it up and letting it go to waste on their 10-acre property, they began cleaning it and separating usable product to sell. That side company, called ROAR (Raymaakers Onsite Aggregate Recycling), employs four of the Raymaakers’ total team of 26. Co-owner of a certified women-owned business enterprise (WBE), Laurie is gratified that perceptions about women in construction have come a long way. She recalls, early in the seal-coating days, that John burned himself badly when a block filled with crack filler splashed him, and for four months, it was just Laurie and her sister-in-law working the driveways and parking lots. After one job, the property owner wouldn’t even answer the door to pay them, having trouble accepting the fact that women were doing the work. Today, that’s just a humorous story in the history of a true regional success story. John is the first to admit that maintaining a strong family business is a tough road, but repeatedly praised the company’s dedicated crews and long-time employees for their role in growing the firm. John noted that not only their sons have grown up with the company, but so have many of their teenage friends, who now work there. “All these friends of our kids, they’ve been here 10, 15 years. We don’t tend to lose people,” he said. That’s a plus for this family that just keeps digging for more opportunities — literally and figuratively.